The first figure I will highlight in this review is the DC Super-Heroes S3 Series 7 Batgirl made by Mattel in 2007. This is arguably the most popular Cass figure on the market. The few criticisms of this figure were her overly-adult body (she shared the same body as the Barbara Gordon Batgirl figure released shortly before), the silver details on her costume, and the Babs-specific details that didn't belong on Cass (like the bat-scalloped boot-tops). I understood all the gripes, but I still loved getting this figure, which I considered a huge step up from the previous DC Direct release. Next up is the DC Direct: First Appearance Series 3 Batgirl from 2005. I have loathed this figure for so long. She is so awkwardly posed that I thought I had a defective figure at first. Plus her ears constantly curl inwards adding to her overall "melting" look. This first photo I took is actually the first time I've appreciated her. With her head turned up and her arms pulled down as far as possible, I actually think she looks kind of cool (but she's still going in the back row of my collection... with the bad kids). The next figure is my favorite. She is from the JLA Classified: Classics - Series 2 from DC Direct 2010. She uses the same Ed McGuiness-inspired body used by the Superman/Batman Series 4 Batwoman figure from 2007. This is just one of those figure that I was hoping to see one day and then DC Direct delivered. I still think it's unfortunate that they never made a McGuiness-styled Huntress like she appeared in Public Enemies, but I've come to terms with that. I think one of the things that most appeals to me about this figure is that she's not a puny twiggy-armed whelp. Kudos to McGuiness for ditching the anorexic prototypical heroine and kudos to DC Direct (now DC Collectibles) for embracing it. 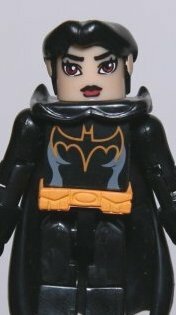 Next up is the Cassandra Cain Batgirl Mini-Mate!! Okay, so she's not technically a minimate. The C3 Line by Art Asylum was the precursor to Mini-Mates and this great little figure was part of the C3 Mini-Flyers wave of 2005. The C3 "Mini-Mates" all came with Lego-Like vehicles. Cass came with a small single-occupant Batwing-type jetpod. Next Up is a series of 4 HeroClix-type miniature figures. Up next is a small vinyl figure from Kotobukiya. This was part of the Batman: One Coin - Season 2 Series from 2005. This little diorama comes in multiple pieces to assemble. It measures about 4 inches across the base. Next up is the Eaglemoss Lead Figurine. Cass was part of the Eaglemoss DC Super Hero Collection as #37 in 2009. There is some debate over whether this is actually supposed to be Cassandra Cain... or at least I like to pretend people are actually having heated discussions over this... possibly even resorting to physical violence. You can read my previous nerd-rant about it all here. Next is a large 9" tall Batgirl Statue Produced by DC Direct in 2003. It was designed by Damion Scott, Sculpted by William Paquet and was produced in a limited run of 1270. I had been seeing this statue in the comic shops for years and shaking my head at the insane pricetag (usually about $110). I didn't like the look of the statue. Perhaps this is why I didn't become a fan of Cass until later on... i.e. when her look became less stylized and more realistic. But I unfortunately am a completist so I had been stalking this on eBay for years and eventually won it for $10 bucks! I still think it's an awkwardly large piece that takes up too much room, but it does make a cool backdrop for my little Cass shelf. Lastly, I have a rare prototype for an unreleased Batgirl figure from Mattel's DCU Infinite Heroes line which was cancelled several years ago. I've been struggling with the idea of painting her, but for now I'm leaving her in raw plastic form. Thanks I'm having so much fun, glad others are enjoying it! I'm jealous of the extent of your Cass collection! I've gotta say I've become a big fan of these blogs, kudos on shining the spotlight on these gals! I don't know if you go on this anymore, but your "Mysterious UK "Cake topper" Batgirl" is actually a game-piece for Batman: Gotham City Mystery. The game comes with 9 game pieces. The heroes; Batman, Nightwing, Robin, and Cain's Batgirl. The villains; 5 ninja. One player is the villain, and up to 4 can be the heroes. It even comes with a "bat-computer." It concentrates on detective work, which is awesome since Batman's detective work is often way overlooked. The game came out in 2003. It typically goes on ebay from $30-40. I have heard of people finding it at thrift stores for $2. Thanks for the info! You know, I actually saw the game on ebay in the last year and thought this might be the figure, but the pictures in the auction were too vague to be sure. I'll update this post soon with that info. I also should put up the Black Bat Chess piece and Heroclix that have come out since I posted this. Thanks again! you rock! Absolutely! 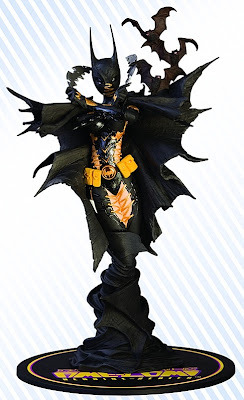 I love this ultimate guide to Cassandra Cain figures/toys. It's actually what told me about the Japanese One Coin Batgirl Diorama and the Japanese bottlecap figure (both of which I just bought).